Tax cuts have given a boost to Americans’ take-home pay this year. The question hanging over the U.S. economy is whether they are putting the extra cash toward savings and debt, or using it to go shopping. Retail-sales data due Monday from the Commerce Department will help provide an answer, and economists are betting that consumers finally opened up their wallets a little wider, thanks in part to the boost in paychecks as well as 2017 tax refunds from Uncle Sam. Sales probably rose 0.4 percent in March from the prior month, based on the median estimate of analysts. That would break a streak of three declines that was the longest such dip since 2015 and reflected the hangover from a debt-fueled, post-hurricane spending binge in the fourth quarter. A rebound in retail sales would be a sign that President Donald Trump’s tax cuts are helping spur growth in an economy largely reliant on consumer spending. Trump and the Republican-led Congress also slashed corporate taxes, a move partly meant to spur wages, which have yet to move significantly higher. 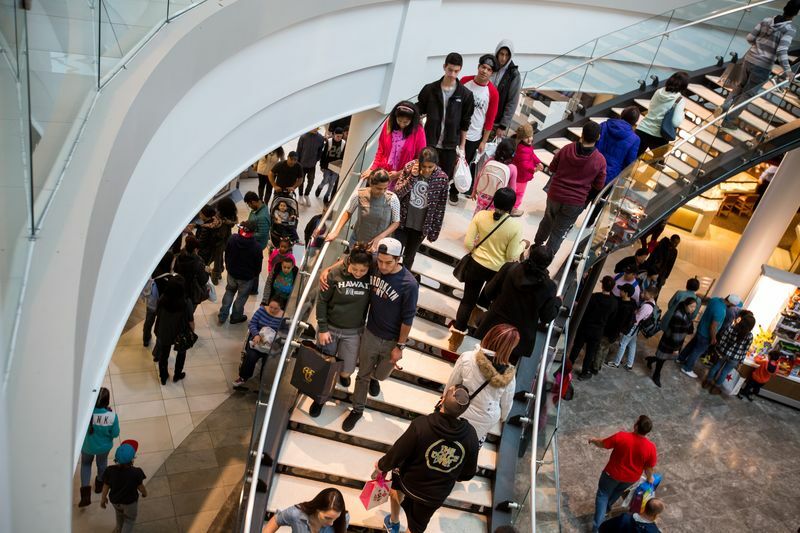 Americans had reined in spending in the previous three months, disappointing market watchers and likely culminating in a relatively soft first quarter for consumer spending. That’s kept estimates for economic growth in check, with analysts forecasting that gross domestic product expanded at a 2.2 percent annualized pace in the January-March period, down from 2.9 percent in the previous quarter. Stronger-than-forecast auto sales in March, based on industry data earlier this month, gave a boost to overall retail sales: Purchases of cars and light trucks rose to a 17.4 million annualized rate in March, the fastest this year. The tax cuts probably supported spending in March as consumer sentiment surged to the highest since 2004 during the month. While hiring eased from the prior month, wage gains picked up and the jobless rate held at the lowest since 2000. March retail sales will mark an important turning point for consumers, given that sales have contracted for three consecutive months. 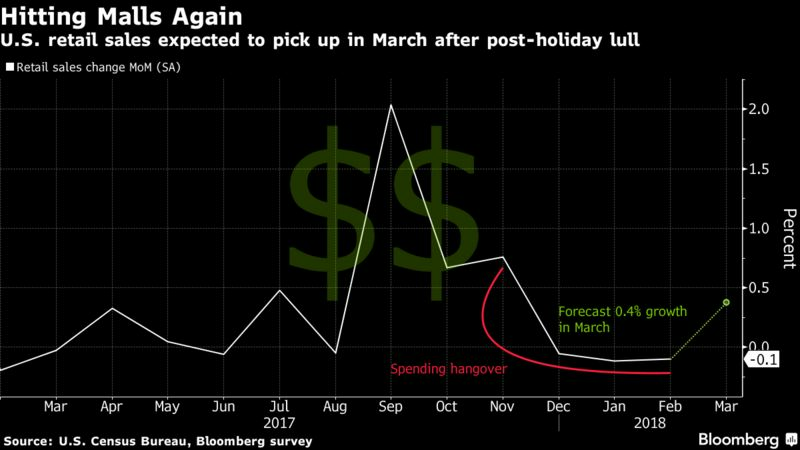 Bloomberg Economics does not interpret the recent soft patch as a signal of economic weakness, but rather as payback from a surge in spending from September to November, which was partly attributable to hurricane-recovery efforts. Nonetheless, a moderate March rebound in sales will not be sufficient to prevent a dip in overall personal spending, and hence GDP growth in the first quarter.